This .357 steel cased ammunition is brand new Russian import. The Tula Cartridge works has been producing ammunition to both military and civilian spec since the year 1880. Tula has produced ammunition for the Russian and Soviet Military during both World War one and World War Two, and throughout the cold war. Today, Tula supplies ammunition not only to Russia, but to governments worldwide. Tula Ammo is seen in a wide variety of roles, from the battlefield to the back woods. 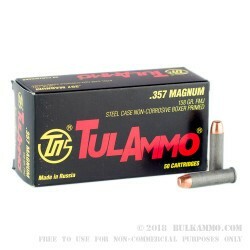 Tula has earned a solid reputation producing cartridges that are reasonably priced, reliable and built tough. All Tula .357 ammunition is new production. 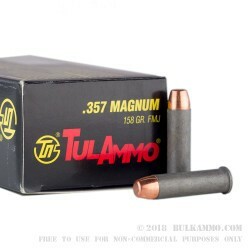 Tula .357 ammunition is in compliance with CIP requirements. Ammunition is polymer coated steel cased. Cartridges are boxer primed and non-corrosive. 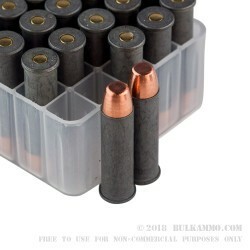 The bullet is bi-metal copper and steel with a solid lead core. Note: Some users have reported cartridge casings sticking in their cylinders after firing, you may want to purchase a box to test. Many revolvers run this ammunition flawlessly. Some mainly imports have been documented to have more difficult time extracting spent casings. loaded 6 rounds in my s& w, .357 revolver, every casing expanded/jammed in the cylinder, & i had to drive them out. the bullets fired perfectly well, but would not eject from the cylinder & had to be driven out. same thing (above) happened tula ammo in my .38 spl. however, i ran 200 rounds thru my 9mm glock 43 with absolutely no problem at all. go figure. Now i have 990 rounds left to do lord knows what with.. I use Tula successfully in my semi-auto handguns and rifles. Unfortunately it doesn't seem to work well in my (only) revolver, the shell casing get stuck in the cylinder of my S&W 686 after firing, it's frustrating and not worth the effort to dislodge them.